There are connecting flights to Timika from the international airport at Port Moresby (60 minutes) as well as other cities such as Jayapura and the international airport on Bali (40 minutes). Distance from city center: 4 km. Which airlines fly to Mozes Kilangin Airport? 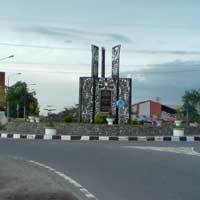 Where is Mozes Kilangin Airport located? The Timika Airport is located just 4 km north of central Timika. How to get from the airport to Timika city centre by public transport? Transportation option are very limited, but the distance to the city is short. You can take an ojek (motorcycle taxi) for Rp 20.000. What are popular destinations from Mozes Kilangin Airport?